ADI has been busy setting in motion the complex preparations that are required to undertake the rescue of Peru’s wild circus animals – which looks set to be a mission exceeding the magnitude of Operation Lion Ark in Bolivia! As reported in the last issue of Animal Defender, it has now been two years since Peru banned the use of wild animals in circuses. 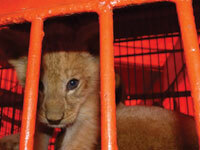 ADI is now assisting the authorities with enforcement and relocation of the animals. Please donate now and help us raise funds for the Peru rescue. 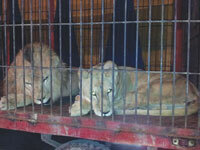 It is important that governments such as Peru are supported in the enforcement of animal circus laws. So providing solutions to the problem of rehoming the animals is one of the most important actions we can take. Twenty-five countries have now ended wild or all animal circuses and similar legislation is being discussed in the UK and Brazil. Our rescue missions are a significant contribution to both saving animals and encouraging legislators to act. Each rescue mission encourages another country to end the suffering. For the past few months, ADI has been tracking down circuses in Peru to count the number of animals and species, and working with government officials to develop the plan of action. It is not without risk. Last year our South American Investigations Manager was hospitalised by a circus after they spotted him taking photographs. But we are all determined to keep going. We have already documented the terrible suffering of circus animals in Peru – scenes which shocked the country and helped win the ban. Now we can save them. 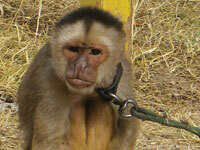 The circus animals of Peru have freedom in their sights. They just need us to go and get them. We will need to hire road and air transport to collect the animals; build temporary holding cages and make the animals secure; provide food and cover veterinary costs as well as travel crates and the main flight to the sanctuary in Colorado, where the animals’ permanent homes will also be built. We have been fundraising for this rescue but still need to raise £400,000 in the coming months. Clearing a whole country of its suffering circus animals is a huge task, but with your help, we can do this. Can you help us raise funds for the Peru rescue? Can you organise a fundraising event, or sponsored challenge? Can you ask local businesses to take some Peru rescue leaflets? Can you help us organise a fundraising screening of Lion Ark in the closest major town? Please become a contributing member of our Peru rescue team with a donation towards the costs.